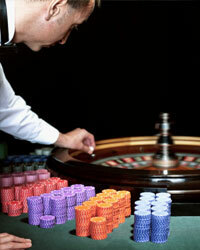 There are two main types of the Roulette game: European Roulette and American Roulette. 1. European Roulette. This type of Roulette is also called "Roulette with one zero". First it was invented in the 17 century by Mathematician Blaise Pascal.The first wheel with one zero appeared in 1843 in Germany. The wheel of the roulette is divided into 37 sectors: 36 numbered from 1 to 36 and 0 slot. The numbers are located in more random order than in American one. 2. American Roulette. In the 19 century the American version of playing Roulette was quite different than nowadays. There were numbers starting from 1 to 28 and 0, 00 and slot with American eagle. And later the game transformed in the modern American Roulette with 36 red and black slots, 0 and 00 slots. Also there are several wagers: Inside (Straight-up bet, Street and Corner (or square), Split, Six Line (or Double Street), Trio, Basket, and Top Line). And Outside (1 to 18 and 19 to 36, a bet on Red or Black, Even or Odd bets, Column Bets, Snake Bet and Dozen Bets. One more notable difference is the color of the chips: in American game they are colored and bets can be differentiated from the chips of other players. In the European Roulette the chips are of the same color. The playing field is divided into 36 sectors arranged in 3 lines in 12 and numbered in an increasing order. There is also a 0 sector and places for outsides bets.Visually the playing field of European Roulette looks like the American one. In fact, the main difference between these two Roulettes is the existence of one or doubles zero slots. The European Roulette Wheel changes the house edge. That's why playing European roulette gives the player more opportunities to win (there are also various roulette systems exist which are believed to increase your chances for winning). And that is the reason of preferring European version of the game by roulette players.